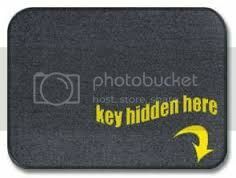 Michigan Personal Protection Tips: Don't Hide Spare House Keys On The Premises. If you have ever locked yourself out of your home, you already know that it is an embarrassing and inconvenient circumstance. As such, some people hide spare keys to their home on their property to avoid being accidentally locked out. Typical hiding places include the following: under a mat, stashed in a flower pot, or placed in a fake rock. The problem with this tactic is that bad guys know to look in these not so secret locations while hoping to find a key that will grant them access to the home and the valuables inside of it. If you feel the need to stash a spare key, a better option is to leave it with a trusted neighbor or family member.